Take the time to listen: Fathers, especially those who are seniors, can be filled with stories from their own experiences that they haven’t shared with you. Shut off your phone and sit with them to let them open up with memories from their younger days. Not only will this give you insight that you can use for your own life, but allowing them to share their memories can help them remain aware. 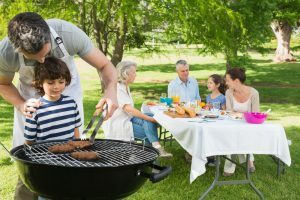 Do something together that they love: Whether it is a sporting event, listening to music, going fishing or even a favorite place to eat, let your Dad decide what the day should be all about. If Dad is not able to get around easily, find a favorite movie, show or sporting event that you can watch together. Technology: If you have a senior Dad that loves technology, offer them some new products that they might enjoy. Fill a digital music player with some favorite tunes, download some fun new apps or even offer a personalized coupon for a few hours of “technology training” to assist Dad with computer or technology updates. Get the family together: Nothing says togetherness like bringing the entire family together. Sons, daughters, grandchildren, sisters, brothers and everyone in your extended family being able to be a part of Father’s Day can bring joy to everyone on this special day! A day for Dad: While there are some fathers that may enjoy the idea of relaxing at a spa for the day, there are others that won’t, but it doesn’t mean you can’t do something special. Take them to a barber shop for a haircut and a shave and help Dad look spiffy for Father’s Day! Appreciating your Dad on Father’s Day doesn’t mean you have to get them a tie or another pair of socks. Showing a Dad what they mean to you by spending quality time together, doing something that they love or just taking care of them for the day will help create memories that will mean more than you may imagine. If you have a Dad, grandfather or other family member who you think of as your Dad, who is at a place in their lives where they need assistance, the culture of care at FirstLight Home Care can help put your mind at ease. To learn more about the services that FirstLight Home Care can offer your loved ones, please contact us today.